Peeling gift from Peter Thomas Roth! The best formulas and results. That is what Peter Thomas Roth stands for. 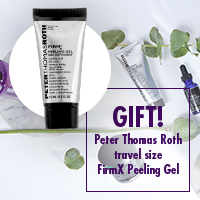 And you will now receive a renewed skin from him with the travelsize FirmX Peeling Gel (value € 10) with every Peter Thomas Roth skincare purchase!